Have a look at my new column for Love Your Larder! This week Nafsika visits Eat.St at Kings Cross and learns more about the developing street food scene around the capital. In search of new and exciting street food, we were recently browsing the very informative website of Eat.st, when and very a peculiar name drew our attention: Tongue ‘n Cheek. 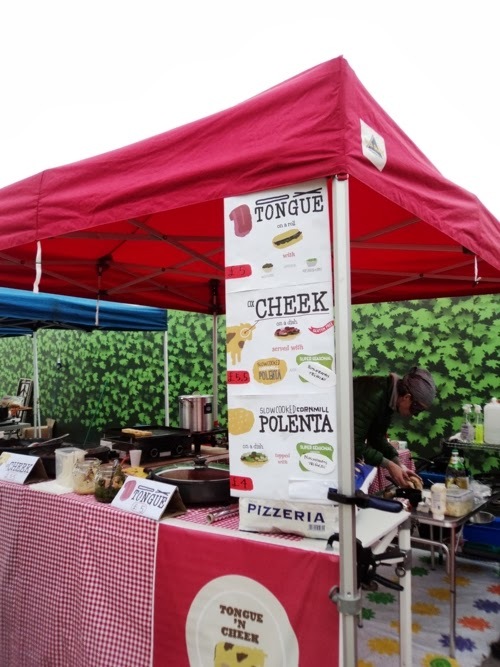 Having never tasted neither tongue nor cheek, we followed the link to a colourful website and after a few emails and a short train ride to Brockley Market we met with Cristiano, the person behind Tongue ‘n Cheek. As it was his day off, we got the chance to have a lovely talk about the British street food culture. 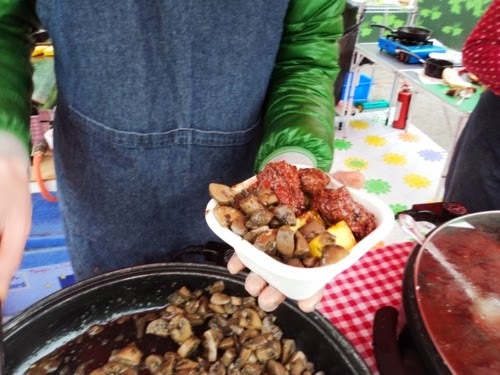 It was a cold and sunny Saturday morning, and the market was buzzing with families and couples who were strolling around, selecting fresh ingredients and tasting the street food on offer. An Italian in the UK, he had a very interesting story to share. He came to London 8 months ago, leaving behind a career in marketing, to be part of what he expressed to be the renaissance of the UK street food culture. He talked about Londoners’ increasing interest in food, the change in food attitudes around the UK, the demand for better quality ingredients, and for more inspiring, interesting, affordable food; dare we say real food? Indeed, we are noticing a change, coming from small markets, street food vendors, collective initiatives and small venues, a change that started with a few passionate people a few years ago. He very rightly noted that even the linguistic aspect of food is beginning to evolve, with adjectives like “tasty” now being replaced by more detailed expressions, reflecting this new era. Cristiano is now part of it and makes his contribution with his spirit, knowledge and of course, amazing Italian-inspired recipes. As we agreed, in the UK people are quite open to change when it comes to food. Street food vendors more often than not feel free to present new ways of expressing themselves, new ideas and new food concepts. Diverging from this pattern, in countries like Greece or Italy, the notion of tradition sometimes clashes with modern influences. Indeed, speaking for Greece, this negotiation between preserving family or regional traditional recipes and exploring new culinary avenues, between tradition and modernity is something that is prevalent in Greek cooking practices. This balance between the past and the present is what often defines the future. In these countries, street food is not perceived as innovative, nor as quality food. While in cultures like Thailand street food is very traditional and a fundamental part of people’s daily lives, here in London it represents the modern, innovative aspect of this country’s culinary expression, while of course still maintaining the traditional values of quality, and of local ingredients prepared with care. The British cuisine offers great variety and diversity, something that we at Love Your Larder encounter every day, working with local producers. As such, street food reflects the different personalities and characteristics of multicultural London. From fish tacos to our Italian tongue and cheek and from Japanese rolls to Spanish paella, the street food community brings together different cultures and civilizations, offering a variety of flavours and smells that please all. Is street food something new? Of course not. Workers used to prefer street vendors for their lunch many decades ago. But when we meet Cristiano a few days later, at King’s Cross, this time in his tent, apron and with his lovely wife Kirie, we understood this new atmosphere and community feeling he was talking about, where all are welcome and come together through their passion and love for good food: “We all aspire to develop street food, to make something together”, he said. Well, they are succeeding. Although we arrive closer to the end of lunchtime, many people were still walking around, ordering their lunch and conversing with the street food vendors like old friends. The tongue and cheek, both slow cooked for hours look very inviting. It’s time we finally taste some! We ask for the tongue first: A sliced sourdough roll from a Brixton bakery, salsa verde, sliced tongue and an apple-horseradish sauce. A delicious combination that truly inspired us to expand our selection of meat cuts. Of course we taste the cheek as well, in case you had any doubts. The cheek is slow cooked in wine or stout from a local brewery, served with polenta and seasonal vegetables (mushrooms being the option today). Melts in your mouth and makes you crave for a second serving. Couldn’t think of a better lunch! Street food lies somewhere between restaurant and home cooked food. And that is exactly the secret to its success. With low prices and high quality ingredients, a handful of creativity and a pinch of luck, your daily lunch can be an adventure. And we love food adventures here at Love Your Larder! 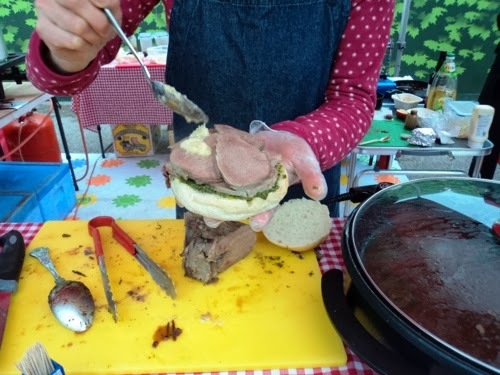 While tasting a new recipe Cristiano is testing, we think of this renaissance of the UK street food culture. It is interesting to ask why here and why now. Why in London and why today? We will explore these questions and the street food culture further, unveiling and coming closer to real food. Could this “fast” food be replacing what we already know as fast food? Could this be the new “real food”? You can visit Tongue and Cheek’s website at http://www.tonguencheek.info/ and get information about Eat.St at http://eat.st/. Eat.St is held every Wednesday - Friday lunch time.